If you are interested in owning lake front property in a new and upscale community, this is a great place to see! Do you own a corporation and are looking for a property to retreat to? We have what you're looking for! From beautiful fishing locations to amazing schools, our community has it all. Take a moment and read about what makes our neighborhood wonderful. We also have a breathtaking gallery. 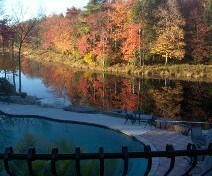 our lakefront, lake view or PRIVATE ESTATE properties. Covington Lakes Estates in Gouldsboro, Pennsylvania, is a quiet residential, private lake community currently under construction in Covington Township, Lackawanna County, Pennsylvania. It's a family owned development with protective covenants to keep the community upscale and pristine! The minimum square footage for homes built here is 2,250 sq. ft. of actual living space, not including the basement or garage. Upon completion of the development, there will be less than 50 lots—meaning there will never be the problem of overcrowding.